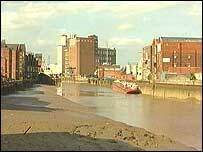 Plans for a new swing footbridge across the River Hull have been presented to council officials. Developers Citybuild, the firm behind plans for the 300 tonne steel bridge, say it will be an "iconic" addition to Hull's skyline. Plans for the structure, which aims to provide easy access from the proposed regeneration scheme The Boom to the city centre, were submitted on Tuesday. 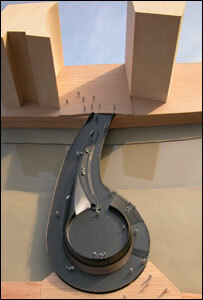 The 60m-wide bridge would be able to host exhibitions and a restaurant. A judging panel including representatives from Citybuild, Hull City Council, Yorkshire Forward and two members of the public chose the design, by London-based architects McDowell and Benedetti. But cyclists have complained they will not be able to ride across the bridge and will have to dismount. Citybuild said: "The minor inconvenience of cyclists having to get off and walk a short distance across the bridge is offset by the creation of a safe and pleasurable place for all those who are crossing the river or wishing to linger and enjoy the special views. "Cyclists riding at speed across the bridge can appear threatening to less confident members of the public and will increase the risk to pedestrian safety." The exact location of the bridge will be confirmed during the planning process, but it has been designed to run from Scale Lane to The Boom. The Boom, when completed, will feature more than 600 luxury apartments plus hotels, offices, cafes and bars on the east bank. It is expected to cost about £88m.